Happy New Year! What a better way to start 2016 than to be inspired by the Rose Blossoms? I've only seen sneak peeks, but I can't wait to see what is shared! There are seven of us in this hop, and it's a great big circle. Just keep moving from blog to blog, and if you get lost along the way, I've got all the blogs at the bottom of this post. 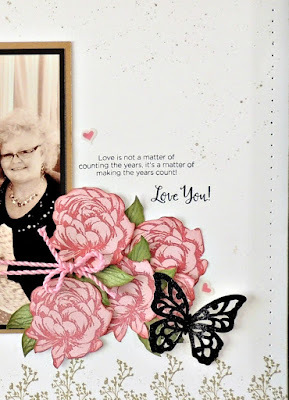 The stamp of the month is called Beloved Bouquet, and I am thrilled with a stamp set filled with rose blossoms! There are also seven great sentiments on this set. $5 with a $50 purchase? It's a steal!! I created a layout for my shadow box frame. 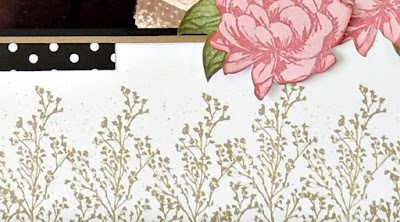 I will show you some close-ups in a bit, but I wanted to tell you that these flowers are so simple to two-step stamp! 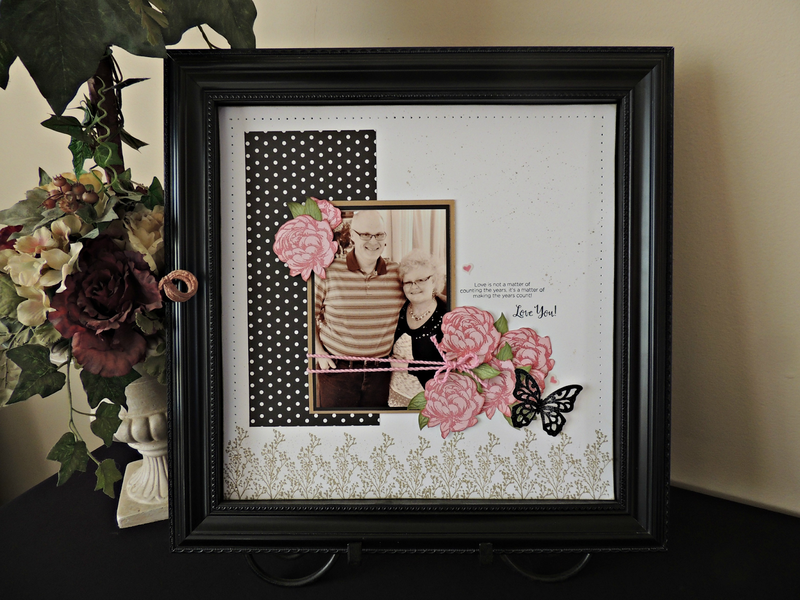 Two-step stamping means you have two stamps to create one image. In this case, I've stamped the background of the roses with Pixie ink. The second stamp is the detail, and I used Ruby for that. They weren't terribly hard to cut out, and after I did, I sponged the edges with Ruby ink. There is a weed-looking stamp in this set, and I stamped that across the bottom of my page. Now I need to show you some close-ups. You'll see in the next photo that I did some faux stitching on the edges using my clear ruler. I also splattered light brown watercolor up in the right corner of the page. Here is the stamp set, and I think you will agree that it is "must-have" for your collection! Now it's time to move on to Lynn's page and her gorgeous artwork. Judging from the peek I saw, we are going to be WOWED! Should you get lost, here is the order! This is such a stunning shadow box! I love how you made the bouquet of roses. The twine is such a great accent! Just stunning! What a gorgeous layout! It certainly is worthy of being framed! I know that this creation will be a treasure for many years to come. So lovely! Funny that both used the same sentiment stamps in similar ways on our layouts. I love that border created with that stamp. I will be trying that on some cards. Thanks for the inspiration. Beautiful layout, I have saved the photo to be able to scrap lift this one. What a beautiful framed page, Brenda! Great hop today! Wow - this is so beautiful! I'm so happy to be able to look at this on my computer screen as big as possible. I knew there were so many details that I wasn't able to see on a smaller screen. EVERYTHING is just perfect. 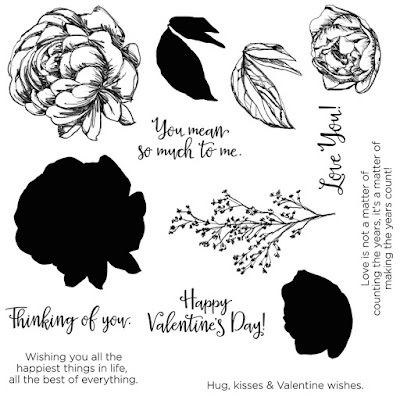 With all the amazing things you used this stamp set for this comment seems like a silly thing BUT I really love those teensy holes that border the page. It contains the whole layout and it's something anyone can do. Of course the clustering is uniquely you and it's obviously all made from your heart. Beautiful!! This is BEAUTIFUL, Brenda! Love the border at the bottom, it's the perfect touch! 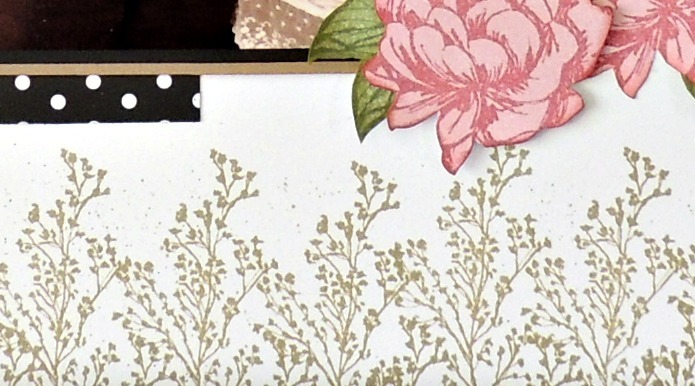 This is just gorgeous....the stamping and the watercolor splashes are so subtle but adds so much. Love the color of the weeds and all of them stamped across the bottom of your page. Such a nice picture of you and Jerry and it is perfect for this page.